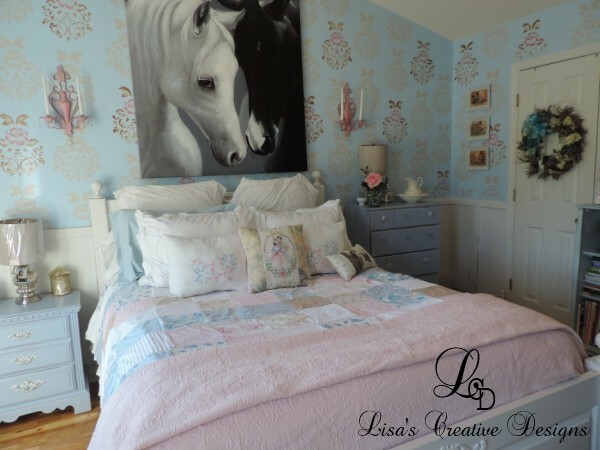 Hello My Bloggie Friends, Today I am very excited to share an upcycled furniture project I recently finished for my Master Bedroom. 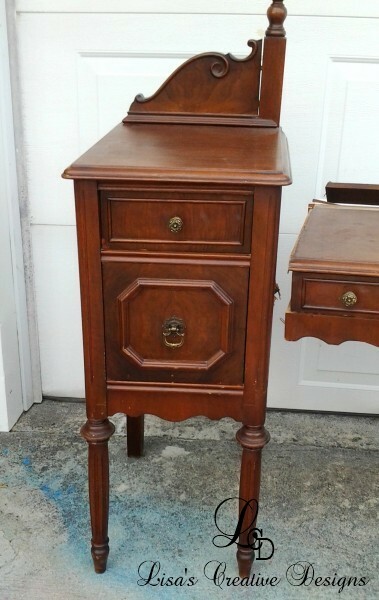 I have been working on my master for over a year now and was getting ready to start working on a pair of nightstands for it when my neighbor approached me with an offer I just could not refuse. She is in the process of selling her home and was trying to carry an old vanity down the stairs by herself, slipped and broke the piece. Oh, Thank Goodness she wasn’t badly hurt! The old relic was of no use to her broken so she offered it to me, knowing I could do something with it. OH BOY, COULD I EVER!!! 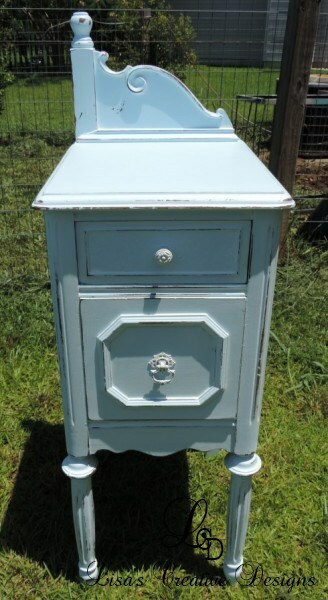 Now, I could have repaired the vanity, fixed it up, gave it a fresh coat of paint and sent it on it’s way but I had other plans for this beauty. 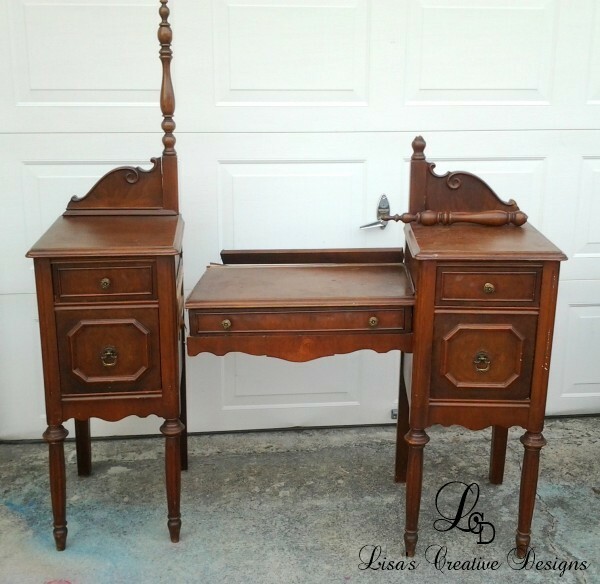 This old vanity had great lines and I had always wanted to convert an old vanity into a pair of nightstands. I have seen this done before and have been dying to try it myself. I separated the pieces, cut down the spindles that once held the mirror…. 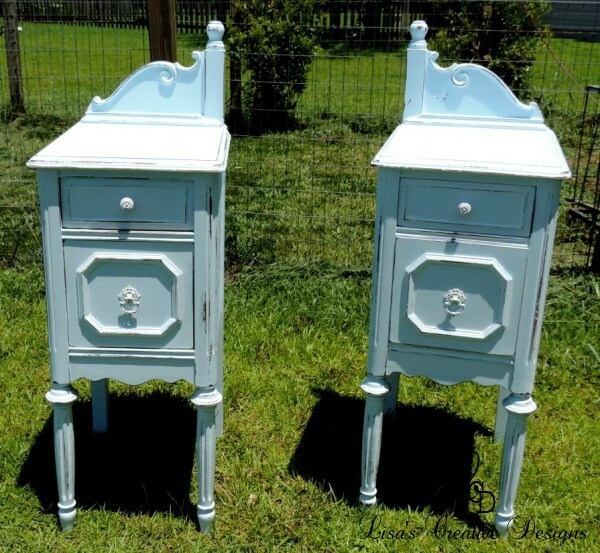 …and painted both nightstands the same soft blue that is on the walls in my master bedroom. 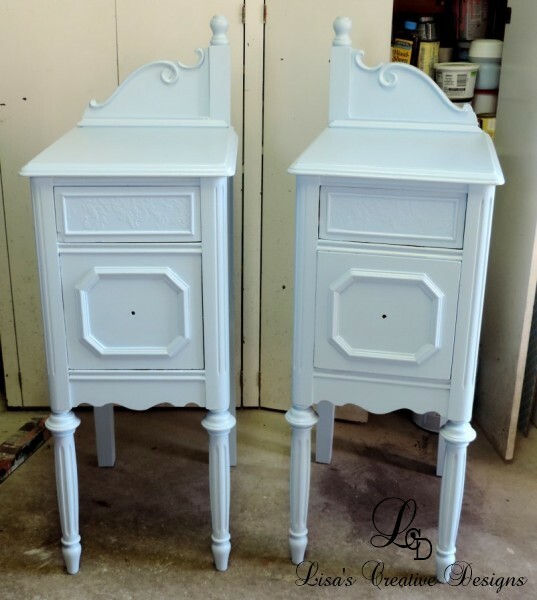 Each one of the Upcycled Antique Vanity Nightstands had a side that was badly damaged due to the separation so I opted to hide the imperfections. 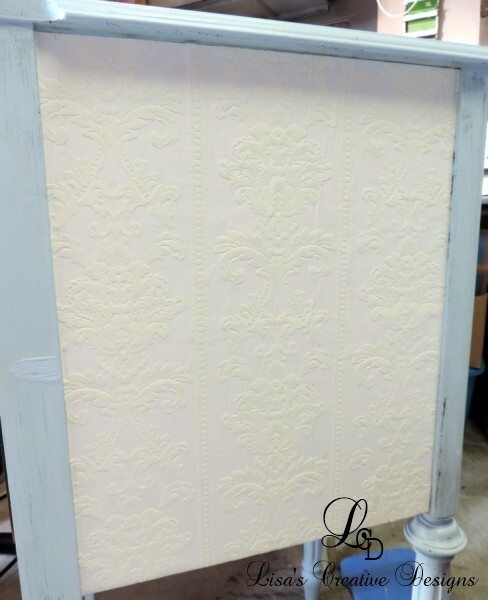 I filled all the gouges and holes with wood filler, sanded it smooth and adhered a piece of textured wall paper over it. I painted that blue as well. 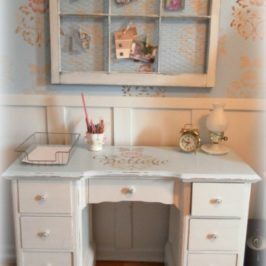 Once the paint was dry I went over both pieces with a white color wash and then distressed them to bring out the details, and to give them a well loved, Shabby Chic look. I reused the original hardware by painting it white. 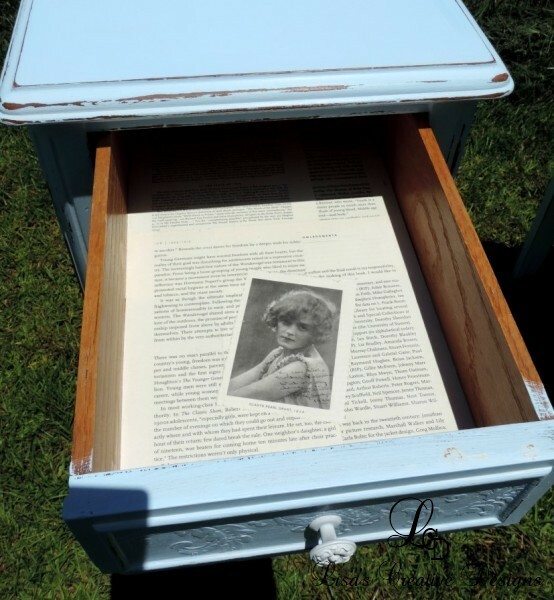 I finished off the drawer interiors with decoupaged vintage book pages and vintage images. 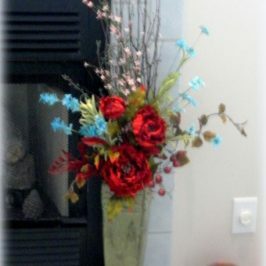 They are now sitting in my Cottage Style Master Bedroom and I love them! 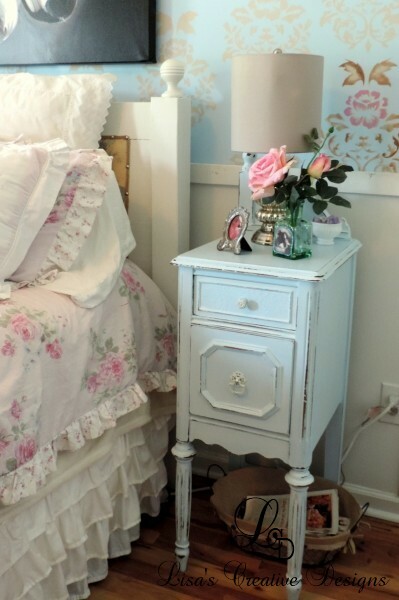 I originally planned on doing a couple of aged mirrored nightstands in the room but when I acquired the vintage vanity I had a change of heart. 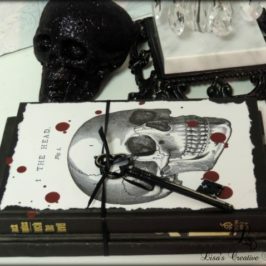 I am still eager to try my hand at a mirrored piece but am going to save that for the end tables in my living room. 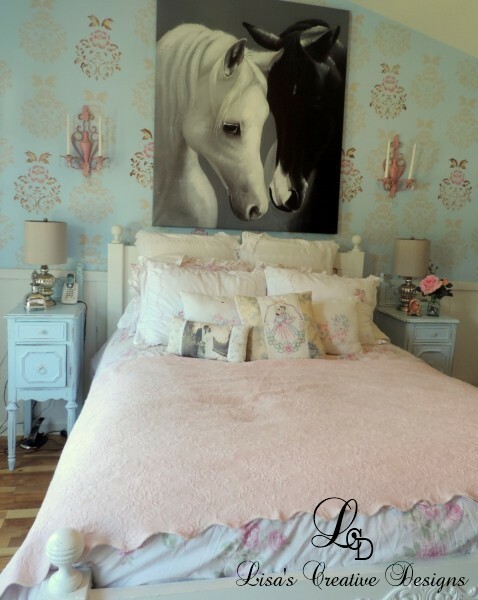 This is a before shot of the my master bedroom. 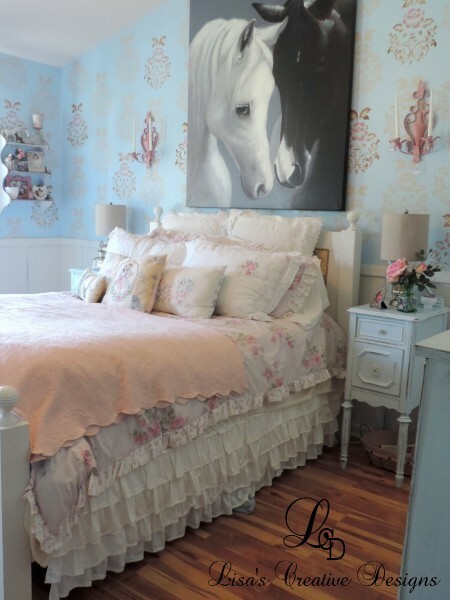 I had a pretty nightstand on one side of the bed and a larger chest of drawers on the other side, making things seem a little lopsided. I had also grown tired of the mismatched set. It was time to change it up a bit. The new set of nightstands are smaller scale and make things look more unified. I am just tickled with the overall results! 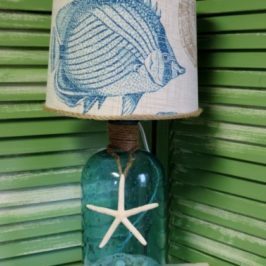 My mercury glass lamps look wonderful on them too! 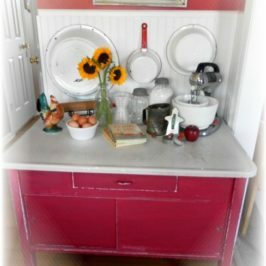 I really had a lot of fun revamping this old vanity and am so grateful for my neighbor’s generosity. 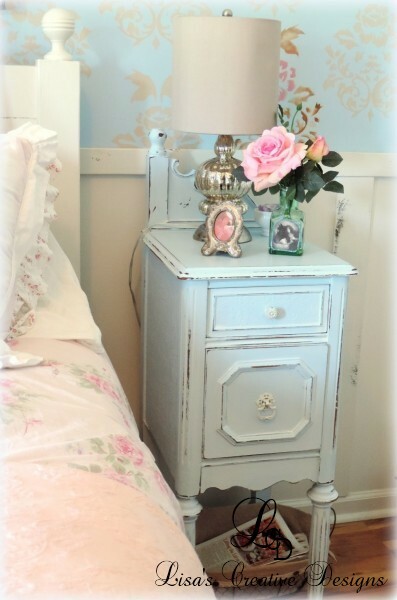 Thanks so much for visiting and letting me share my new upcycled antique vanity nightstands today! What a shame that the dresser was broken. I hope you also upscaled the middle piece. It would make a great desk. Hi Lana, I actually have the center piece in storage and do plan on creating a small desk out of it. I just need to find a few cute legs first. I also have the beautiful mirror as well! Thanks for visiting! Great idea and very inspiring. Great idea! Very useful and so darn cute. 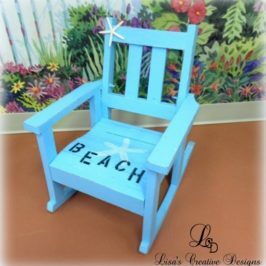 That was an awesome upcycle! Love the color. Beautiful! Love these, nice work!